Where are South Africa's black African batsmen? 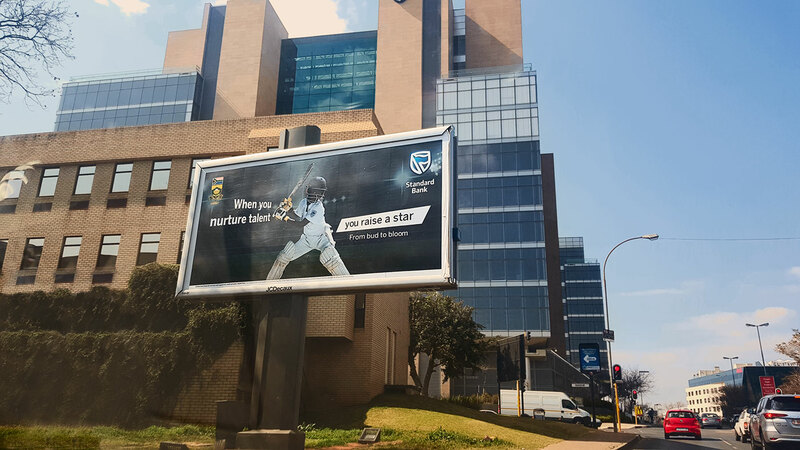 In the heart of Rosebank, one of Johannesburg's wealthiest and fastest-growing suburbs, stands a billboard that evokes optimism in every cricket fan who passes by. A young boy in an oversized helmet raises a well-worn bat as he coils his body in anticipation, ready to strike at a ball only his intense gaze can see. Shrouded in the glow of stadium light, the boy is flanked on either side by an encouraging message: "When you nurture talent you raise a star. From bud to bloom." As uplifting as the sentiment may be, this is a narrative that does not reflect the reality of cricket in South Africa today. The young boy on the billboard is black African, one of roughly 43 million who comprise over 80% of the country's population. Because of the colour of his skin, he is far more likely to play for the Proteas as a bowler than as a batsman. Of the 18 black Africans (see list below) who have earned an international cap for the South African men's side across the three formats, only Loots Bosman, Temba Bavuma and Khaya Zondo have been selected as genuine batsmen. With the latter recently omitted from the ODI squad, Bavuma is now the only black African batsman assured of an international cap. 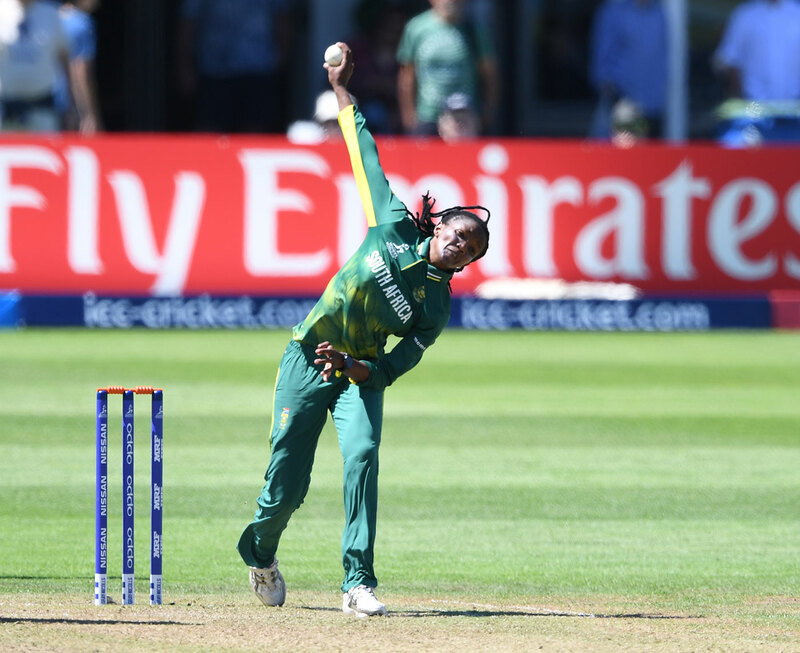 The same dearth exists in the women's game, where Ayabonga Khaka is the most prolific black African run scorer and wicket-taker for South Africa in ODI cricket. She is, however, ranked 44th on the batting charts with a meagre 4.3 average, compared to her sixth position on the wicket-takers' list, with 62 wickets from 54 matches. The contrast with the rich and developing history of black excellence with the ball is stark. Makhaya Ntini's 390 Test wickets stand as a monument for a racially diverse society. The promise of Kagiso Rabada and Lungisani Ngidi sharing the new ball for a generation has fans salivating. Throw in the rise of the bowling allrounder Andile Phehlukwayo and the future of black cricket looks secure in one department at least. Why does such a disparity between bat and ball exist? Transformation targets are being met at all levels and yet batting cards are dramatically lopsided. For Corrie van Zyl, a former fast bowler and now CSA's general manager of cricket, the primary reason is the prevailing socio-economic inequality that still divides the country along racial lines. "To be a batsman, you need to have access to high-quality coaching, facilities and equipment," says van Zyl. "It is much easier to develop a bowler than a batsman and so we can train a young kid from a poor background to become a bowler." This sentiment was echoed by Hashim Amla in the Cricket Monthly earlier this year: "Most of the top bowlers in South Africa don't necessarily have to go to a top cricketing school, because their development happens later, whereas in batting, you have got to have the good coaching and then the upbringing of batting." Indeed, seam bowler Junior Dala, who recently made his ODI debut against Sri Lanka, is one of the few professional cricketers in South Africa who is not a product of an elite school. 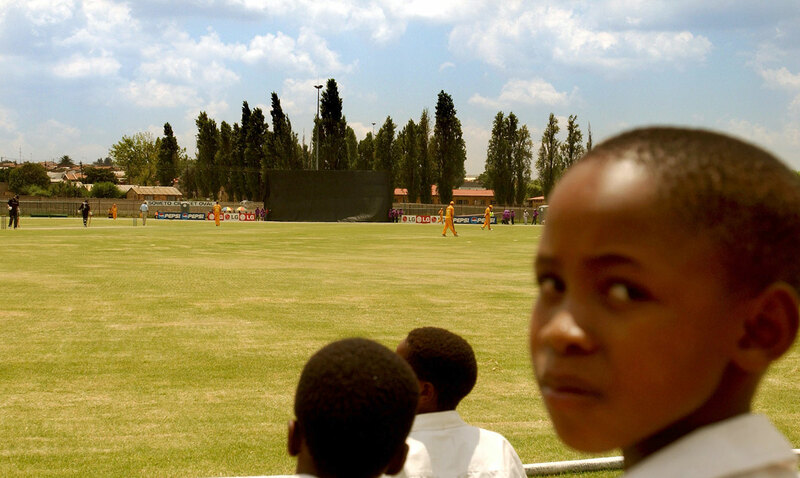 In order to substantiate the claim that batting talent needs a privileged base, CSA's cricket research consultant, Dr Janine Gray, conducted an experiment that studied the visual-motor skills of provincial Under-15 batsmen from a variety of socio-economic backgrounds around the country. Researchers had the young batsmen facing a screen with an image of a bowler running towards them and gathering to deliver a ball. The image was cut off at various phases - just before release of the ball, upon release, and 200 milliseconds after release. The batsmen then had to decide where the ball would land and press a button as quickly as possible to indicate what stroke they would play. Dr Gray and her team discovered a causal link between a poor upbringing and diminished visual-motor skills. Children from poorer socio-economic backgrounds were significantly slower. What is interesting is that the few black African children who came from comparatively wealthy homes produced similar results to their white counterparts. "When we publish our findings we may not even raise the ethnicity of the children, as there is a danger that some people may use that to suit their racial biases," Dr Gray says. "But you'd have to be blind not to know how the different races are impacted by inequality. Having said that, our findings help explain why we're not producing as many black batsmen as we are bowlers." Although Dr Gray cautions against sweeping, conclusive statements, she is optimistic that these initial results will lead to more in-depth research. "What we have is merely observational at this time because our sample size was not large enough to make definitive claims, but it would seem that a lack of resources - from the kinds of toys that children play with at a young age to the facilities they use to develop their cricket skills - can lead to a delay in the development of one's visual-motor system." CSA has since taken steps to improve the development of this system in young children as early as possible. The KFC Mini-Cricket programme, the first stepping stone in the sport for more than 119,000 registered boys and girls, has been given a technical revamp and its coaches provided specified training. Dr Gray points out that although disadvantaged children are forced to play catch-up when it comes to visual-motor skills, there is evidence to suggest that those starting from the back could benefit from accelerated improvement as they develop. The challenge is ensuring that they do. "Transformation" and "selection targets" are dog-whistle terms for many fans who would prefer to ignore the inequalities of the past and enjoy their sport without the requisite side order of politics (as if such a scenario were possible). This subset of supporters aside, there is no denying that directives from CSA, first implemented in 2004, have had a positive impact on cricket's racial diversity. "We have seen what can be done when players are given the opportunity to perform," van Zyl says. "When we first started rolling out selection targets, we were very broad in what we wanted. We weren't too choosy with regards to the type of black African players within the playing team. If they were all bowlers or specialist wicketkeepers it didn't matter. Now, after identifying the lack of quality batters, we are narrowing our focus with a policy called 'targets within targets'." As the name suggests, this new strategy, adopted ahead of the 2017-18 season, stipulates that within the required number of black African players in the team - three or more per side in franchise and provincial cricket - at least two have to be batting in the top six. At the 2016 Coca-Cola Khaya Majola Week, the annual inter-provincial U-19 tournament, black African batsmen batting in the top six registered a combined 123 innings. This amounts to 22.99% of all trips to the crease by top-six batsmen. In 2017, once the new policy was implemented, black Africans in the top six took guard 187 times - 33.75% of all innings played in these positions. The statistics from other age groups are just as impressive. In the U-13s there was an increase of 82 innings between 2016 and 2017 for black African participation in the top six; for U-15s the increase was by 55 innings, and for U-17s the figure was 21. In all four age groups there were improvements in runs scored, balls faced and batting averages of black Africans. With increased opportunities, black Africans are proving they can contribute as batsmen. It is important to note here that this is not at the expense of white cricketers, as the stats indicate that white batsmen are still contributing more runs from more innings than all other races across the four age groups. This is not about taking away limited opportunities from deserving recipients. This is about providing opportunities to those who were denied them in the past. "You can't believe the difference it makes to a player when he feels trusted by his coach and the selectors," says Geoffrey Toyana, who was the first black African coach of a franchise in South African cricket, with Lions. Toyana was also one of the few black African batsmen on the domestic circuit in the late 1990s and early 2000s, and in 1999-2000 became the first black African to break into the top 50 run-scorers' list in South African first-class cricket. "Once he knows that failure in one match will not result in him losing his place, he can go out with confidence and perform week in and week out. This 'targets within targets' will have long-term benefits." The new policy is not without complications. Across the four age groups at inter-provincial weeks last season, black Africans opened the batting or batted at No. 6 more than any other demographic. 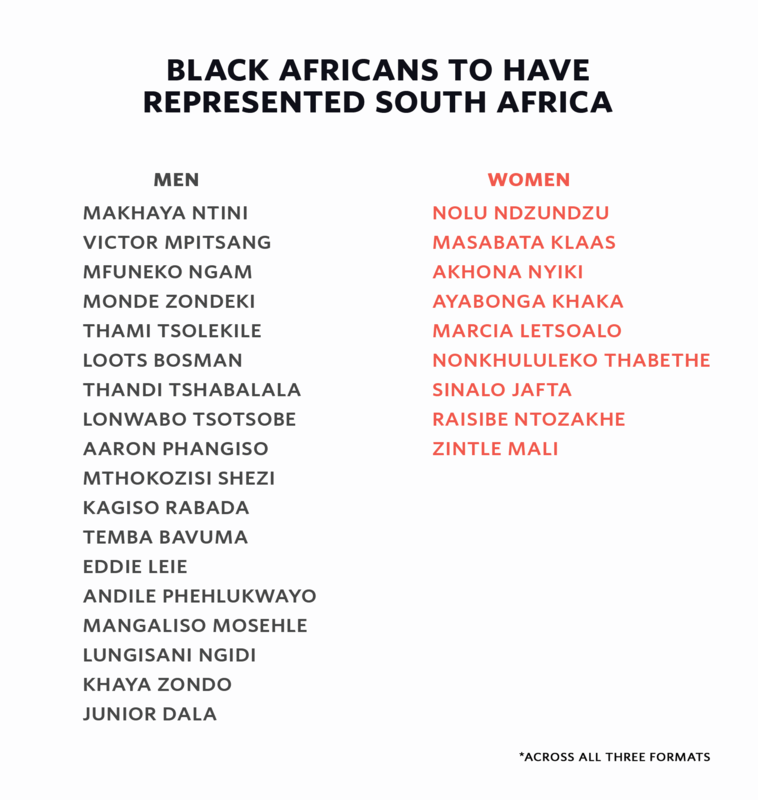 Roughly 86% of all black Africans in the top six occupied these positions. Conversely, white players walked out at Nos. 3 and 4 more than any other race and at No. 6 less than any other race. According to CSA's cricket services manager Edward Khoza, this indicates that provincial coaches are still apprehensive when it comes to selecting black Africans as their most valuable run-makers. 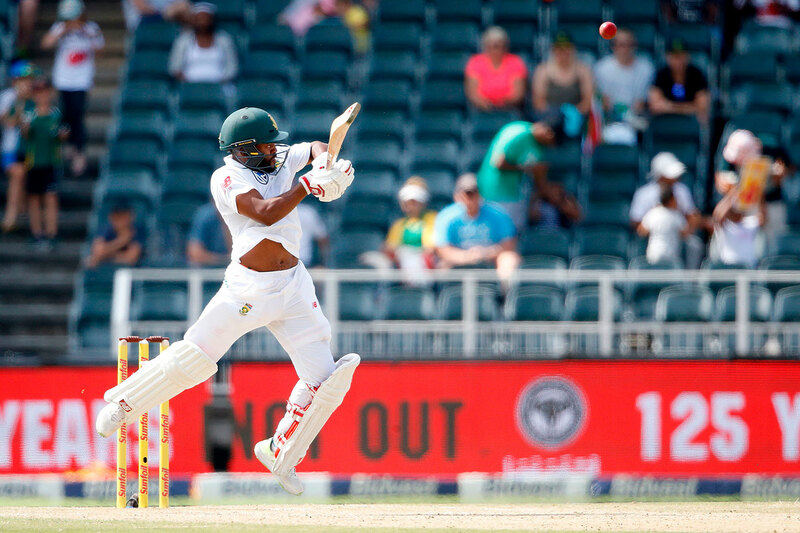 "Black batters are exposed to the new ball more than any other group because they are largely seen as expendable - it's great if they come off, but if they edge off early, it's not the end of the world," Khoza explains. "A side's primary batsman usually goes in at three or four. Coaches then crowbar a black child in at six in order to fulfil targets." To combat this trend, CSA has vowed to be more strict when it comes to roles. If a child has been identified at an academy or at school as a middle-order batsman then the provincial coach will be instructed to bat him there. As Khoza explains, "If he bats at four for his school and has developed his game batting at four, then why are we not batting him at four? There must be role clarity or else we're just playing musical chairs with these youngsters and will do them damage in the long run." There is another downside to selection targets and enforced role clarity. No matter how many runs or wickets a black cricketer accumulates, the "quota" tag hangs over their head like a circling vulture, ready to swoop whenever failure strikes. "Even Ntini was labelled a quota player," Toyana says. "If he had to deal with that, imagine what the rest of us have gone through." Cricket is an unforgiving sport, batting doubly so. An advantage of being a bowler is that one can cool off at fine leg and return for another spell once the nerves have settled. Batting offers no second chances. "I do believe the 'quota' tag impacts batsmen more than bowlers, and that is perhaps why we've seen this unequal distribution in black players," says Omphile Ramela, the only black African with a double-hundred in first-class cricket. "One needs to have a clear mind when batting. One poor shot and some guys can go to dark places where they start remembering all the negative things people have said in the past. Their mind drifts and all of a sudden they're wafting at a wide one and nicking off for 20. That fuels the flames and the cycle continues." Apart from being a professional cricketer, Ramela holds a postgraduate degree in philosophy as well as a master's degree in economics from Stellenbosch University. He calls CLR James' Beyond a Boundary his "cricket bible" and makes a point of raising uncomfortable conversations about race and class in the change room. He believes that overcoming the unique psychological challenges black cricketers face is just as important as tackling wealth inequality and access to resources and training. "All top cricketers talk about being in the zone and reaching a mental space that brings out the best performances possible," Ramela says. "Imagine walking out to face a menacing fast bowler or needing to rescue your team from a difficult situation and you're questioning your validity in the side. It's a tough place to be in. I've seen many talented black batsmen melt in the bright light of elite cricket because they couldn't handle the extra pressure that comes with being a player of colour in this country." Could this be a primary reason why the first and only Test hundred scored by a black African, by Temba Bavuma against England in January 2016, was preceded by 19 five-wicket hauls by black African bowlers? For the man who scored that famous century in Cape Town, the issue is hard to quantify and resolve. "It's tricky because you can't change the way people think just by throwing money at the problem," says Bavuma. "Growing up, I never saw myself as a black cricketer. I just saw myself as a cricketer doing his thing. The colour of my skin was never an issue for me until someone told me that it was. When I turned professional I had former players and journalists wondering why I was being selected and I was called a 'quota' player. I struggled to get my head around that because I had been producing results." *Since franchise cricket started, there has never been a season with fewer than five black African bowlers among the top 50 wicket-takers. In that time, there have only been three seasons (out of 14) that have not included at least one black African among the top ten wicket-takers. The increase in black African batsmen in the top 50 has not come at the expense of black African bowlers in the top 50. Ahead of Bavuma's hundred at Newlands, not far from where he grew up in South Africa's oldest township of Langa, his credentials were questioned on Twitter, by Kevin Pietersen, who probably didn't know, or even care, that Bavuma had become the first black African to finish among the top six run scorers in South Africa's premier first-class competition two years running. "I tell young black kids to be tough, to brush off the criticism and to prove the critics wrong out in the middle," says Toyana, now employed in a high-performance role to help nurture young talent. "But it's difficult. We're not going to create the next Temba Bavuma if we don't create the right environment." CSA realises that not every talented cricketer from a township or impoverished community will be handed a scholarship for an elite school. In order to bridge the gap between the haves and the have-nots, the board launched the Player Performance Plan (PPP) in 2016. In association with the Make a Difference Leadership Foundation, an organisation that helps promising youths obtain academic funding, CSA assesses over 1600 players (from U-13 provincial cricket through to the senior national side) and provides tailor-made programmes to suit their needs. "PPP was born out of the fact that we weren't producing enough black batsmen," van Zyl says. "We identified that black kids from townships were playing around seven matches a season compared to the kids in elite schools who were playing more than 40. They were using inferior equipment, they struggled with transport, they weren't always eating right, the coaching wasn't up to standard and the facilities they played on weren't conducive to developing sound techniques. Unless we bridged the gap between the privileged and the disadvantaged, nothing was going to change." As we speak, nets are being erected, bats are being shipped around the country and fields are being made available for competitive matches. Perhaps most crucial of all is the introduction of a mentorship programme that brings in skilled professionals who are able to assist young players in ways that their coaches cannot. By helping with "below-the-surface elements" - as CSA has termed the psychological and mental challenges that come with high performance - van Zyl is confident that the "performance gaps" between rich and poor can be closed. "Our goal is to produce a cricketer from a township or rural community who is good enough to play for the Proteas," he says. "We know we have a long way to go but we feel we are heading in the right direction." The current SA U-19 side is captained by Wandile Makwetu, who scored an unbeaten half-century batting at No. 5 in a six-wicket victory against England in July. Above him at Nos. 3 and 4 were Thamsanqa Khumalo and Sinethemba Qeshile. Black batsmen are finally getting the chances they need to succeed. They are operating in a system that seeks to maximise their potential while giving them the assistance needed to develop into elite cricketers. How long then until we see Bavuma joined by a black African team-mate in the middle order for the Proteas? "I'd be very surprised if I play my entire career without another black batsman alongside me," Bavuma says. "When I was growing up I had to look at the West Indies and to Brian Lara for a hero to idolise. Today, young kids have more faces they recognise on TV. It's a snowball that won't stop. We're showing that black people can bat and we're not just meant to bowl." A young black African child with aspirations of scoring a hundred for South Africa still needs a multitude of variables to work in their favour. Yet when that child looks up at a billboard in Rosebank and sees a fellow black African youngster shrouded in lights, he will see a vision of a dream that is achievable.